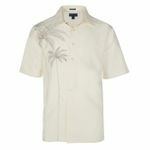 Embroidered shirts are beautiful intricate pieces of art. 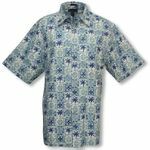 MauiShirts offers a select handpicked selection. All are created in very small quantities. These embroidered shirts are truly amazing. The intricate patterns and images are truly beautiful and breathtaking. The photo illustrations on our pages simply cannot capture the beauty of the objects and scenes created by this ancient sewing technique. Embroidery is an art of needle handicraft sewing of raised words, designs and embellishments with thread upon the rayon, silk or cotton shirts. Embroidery dates back to 5th to 3rd century BC in China. The development of machine embroidery for mass production started in France in the mid 1800s. 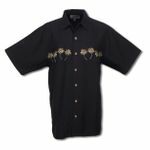 Today's industrial embroidery is computerized and digitized and began approximately in 1980's. Would you like to see many of the old Paradise Found and Diamond Head Sportswear Prints?